Certificate of Excellence from Trip Advisor for the FOURTH year in a row! Woo Hoo!! Trip Advisor Certificate of Excellence – 2 years …. NO, correction, THREE years in a row! 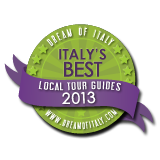 VERY proud to be included in the 2013 list of Best Local Tour Guides of Italy! We go out all year around. Most days of the year. Contact us, let us know your preferred dates, and we will let you know the availability.